I’m not sure what was REALLY going on here. Maybe this Dearbornistan Muslim guy was trying to shoot his wife or kids, or threatening them with his gun and it accidentally went off. But I highly doubt someone “accidentally” shot himself in the leg “while sleeping.” Sorry, not buying this story. And any law enforcement parties who do are morons. This was probably an Islamic honor killing gone awry after a struggle. What Was Mahmoud Ajaj Really Doing With His Gun? A 30-year old Michigan man shot himself Monday morning while napping in his car parked on the Ohio Turnpike. Ohio State Highway Patrol troopers are investigating the 1:38 a.m. shooting, but troopers said it appears Mahmoud Ajaj of Dearborn, Mich., accidentally shot himself after falling asleep. Ajaj grew tired while driving and decided to park on the side of a westbound lane near Fremont, said Sgt. Gregory Blake, with the state patrol’s District 10 Investigation section. PUH-LEEZE. How the hell do they know he fell asleep or “grew tired”? This is the story Mahmoud told authorities. I don’t believe it. In the car with Ajaj was his wife and two children, ages 3 years old and 7 months old. After parking on the side of the highway, Ajaj took out a gun that was in his car’s glovebox, troopers said. “He said it was for protection in case someone tried to rob them,” Blake said. Ajaj held the gun on his chest, the barrel pointing toward the driver’s-side door. As he drifted off to sleep, he inadvertently squeezed the trigger. “It appears like an accidental shooting,” Blake said. Appears? It doesn’t appear at all like that. It’s a dumb, halal-version “dog ate my homework” story, and these Ohio troopers actually believe it. The bullet entered Ajaj’s upper left thigh and exited his lower thigh. He then drove to a nearby exit as his wife called 911. Um, yeah, if you point a gun toward your car door and accidentally pull the trigger, the bullet always turns around and heads not out the door, but downward into you thigh? Riiiiight. You don’t have to be “Quincy” to know this is baloney. He was taken by ambulance to Physician’s Choice Hospital in Fremont, where he was then flown by medical helicopter to Mercy St. Vincent Medical Center in Toledo. By late Monday he had already been treated and released from the hospital. Hmmm . . . I wonder who paid for the Medivac and the emergency treatment. Let me guess. YOU. DID. Charges have not been filed, and the investigation is ongoing, troopers said. Yeah, like I trust the morons who believe this cockamamie Muslim story to “investigate.” Who needs Inspector Clouseau when you have these guys? In case you were wondering, Ajaj’s cousin, Moufid Ajaj, owns Dearborn Cab and Van. And he’s doing the Islamo-apologist tour, telling local media outlets that it was “just an accident” and what a “responsible” person his cousin is. Uh-huh. Mahmoud Ajaj, by the way, has a concealed pistol license. He’s exactly the kind of guy who SHOULD. NOT. HAVE. ONE. I feel sooooo much safer with this guy packin’ heat.
. . . at 1:30 AM . . . with wife, infant and toddler in car. . . .
Debbie, when I read this article I thought of you as soon as I saw the muslim name and Dearbornistan. I hope the Ohio State Highway Patrol is truly not as naive as the article quotes imply — and undertook a thorough search of car. Keep hopin’. But clearly, as Dave indicates, naivete is the controlling force here. Naivete in the face of Islam. That’s America, baby. Almost ten years after 9/11, still giving obviously lying, violent Muslims on our shores the benefit of the doubt–no, the benefit of far beyond the doubt. Logic which no one understands but Muslim is a islamic Logic. Defies Logic. The trigger must be squeezed. Obviously these idiot detectives know absolutely nothing about Islam. But like the MSM will tell you that they know everything of importance. That Islam is just like Christianity without the violence and hatred. I nominate him for the Darwin Award. I think you have to kill yourself to prevent spreading your genes to a future generation to win the Darwin Awards. The guy lived and already has a family so maybe, at the least he deserves an Honorable Mention..or maybe a Merit Award? LMAO. I could read stories like this every day. Have to agree with you on all counts Debbie. I think it’s possible that an idiot who doesn’t know much about guns would be so stupid as to do this stupid self-shooting. It seems less likely that he’d pull over with wife and kids in car and expect to be able to sleep, unless he has rendered them so afraid of him that he knows they will be quiet. I’m going to guess that unless he is a dolt who cuddled a gun while sleeping, he was planning to shoot an infidel or two when they stopped to help his “broken down” vehicle. Then he could toss the gun and drive off with wife and kids as camouflage — just Daddy and Wifey and Kiddies on a nice drive. Of course a family driving around at 1:38 am is a little odd, but obviously the police are committed to not seeing anything suspicious in this situation. Another thought — that Wifey and Kiddies were camouflage for what was in the car and about to be sold to dangerous strangers. 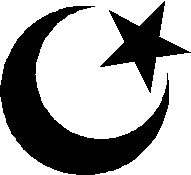 Anonymous, if not an honor killing gone awry, that would have been a good opportunity to get a few infidels under cover of darkness for Allah. And with the wife and kids as witnesses, who is going to check what he was doing in the morning. And a normal family is either staying a motel or they are at home 1:30 AM in the morning. Sorry, not buying their sleeping in the car. How many homeless people do you know A) have one and B) pack heat? There’s more here than the OH cops are letting on. Would this apply at all? Just sounds like a doofus who doesn’t understand Glock triggers. How does this make any sense whatsoever? 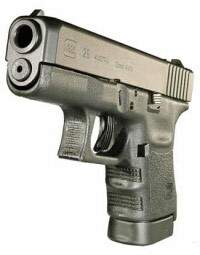 How many people take a gun out of the glove box before going nite nite? Does Ajaj have better aim when unconscious? Also, why was he out with his entire family at around 1 A.M.? Did anyone even bother to ask the shootist that question? I suspect that something very bad was going to happen, and if not for Ajaj’s goof the wife and perhaps the kids would not have been returning home with him that day. DWM…Driving While Muslim. Maybe a new category of hate crime? No, JeffT. It’s more like Sleeping with a Gun while in a car with family at 1:38 am and claiming to shoot oneself while snoring while being a member of a group that deserves to be profiled. It must have still been dark outside.That, must have contributed to the idiotic investigation by the Troopers.Gosh, I thought the OHIO Troopers were the best, guess I goofed on that one. BTW – If you’re a Muslim, pulling over on the side of the highway in Redneck central, you sure as sh!t take you gun out of the glove compartment and sleep with your finger on the trigger. Heck, I would do that and I’m a white devil myself. Yawn. This dude was out with his family at 1:38 A.M. He decides at this early hour with a wife and two kids and decides to take a nap? By that little little rant using “redneck” and “white devil” you blew your cover Khalid. In trying to defend this guy, you revealed what an absurd little Islamist you are. You convince no one here. Go back to your wudu, since you are not worth a stale loaf of bread as an apologist. Interesting that no weapons violations were filed. If I recall MI and OH law, wasn’t he carrying a concealed weapon with out a permit????? i love how the story turns from “a man accidently shoots himself” to “violence in islam” its amazing and quite sad how people are so desperate to talk about how violent islam is. islam is perfect. muslims are not. dont’t confuse the two. i could go on and on about arrogant people that find a way to insult the religion of islam when it is in fact the people who practice the religion that did the wrong…..but what a waste of time and breath that would be because arrogant people will always be arrogant people………unfortunately. As if that humiliation wasn’t enough, as she reached the lift button she looked back in our direction and amusingly sneered, “Boy is you expecting an eclipse or something. Because the axis of movement in any route possible, while the electric features needed only for the rotation axis. These are hellish images and maybe there is a hint of prescience of his own impending death; He told himself that he was a drowning man with his life flashing before his eyes. The vibration and noise level could be classified into Z1, Z2 and Z3. People participate in these two sports are for their own satisfaction – these movements are nothing for the audience to see. Their name and rank, martial art styles, and a brief biography was listed along with a general description of the act that they were going to do. We gradually realise that she is either in some way the ghost of Madeline both accusing him of little cruelties and begging that he release her or she is someone else, a daughter. This might give you an idea of the introduction that was planned for Master Con. ” and that the stories “are either designed to entertain or scare the reader who ever reads them because nothing is more frightening than a true story. The euphemism of sleeping is ambiguous, even in Patmore’s optimistic hands. angular get in touch with ball bearings based on the various specifications of utilization. To begin with, let us be familiar with the KOYO Tapered Roller Bearing 44649. He asked his “humble disciple” to clean it up but I told him that I had to use the bathroom and I conveniently stayed in there until I figured he had finished. Picture this: Tall, scrawny, blonde tipped roots spiked in that look at me kind of way. The students were first divided according to their age, then according to their rank; then assigned to a circle. She was wearing all white: shoes, stockings, pants, and jacket. Addition to providing that needed bearings, SKF Corporation also helps the Hewland improve the inner ring and outer ring of bearings to meet specification requirements. Those days, roller skates are very typical for people. I have something to contribute to the conversation. Usually it’s triggered by the sincerness displayed in the post I read. I’d like to follow you. Could you make a list the complete urls of all your community sites like your Facebook page, twitter feed, or linkedin profile?